AirConsole has the best selection of games for eight players! There’s always a good reason to hang out with your best friends. Humans are social beings, which is why we have grown to love video games. Online gaming has taken over the scene, providing us with a way to play with all of our friends at once. No longer are we limited to only playing games that allow two to four players. Today, we can play group games that allow as many as eight players or more. Today, you can play 8 player games in your home, on the road, or even in the office, as long as you have an internet source, screen, and smartphone. If you’re looking to host a small gathering with eight people, there are plenty of 8 player games on AirConsole that will allow you and your friends to enjoy an evening of entertainment. If you want to ensure that your next game night, event, or party is absolutely memorable, you can bring along multiplayer games found at AirConsole. This way, everyone can join in and no one has to be left out. This is the perfect solution for an otherwise drab night when you have to stay indoors for the evening. Many of the 8 player games available on AirConsole are also suitable for a casual business setting. If you’re hosting a small get-together with a few of your colleagues, this is one way to ensure everyone has a great time. Quizzes, trivia, and an assortment of other games can all be played either as a team-building exercise or during your next lunch break. Get your co-workers and bosses laughing and playing together at your next company event this week. Invite the neighbors and their children over for a combined family night of fun and games. You can find exceptional games on AirConsole that would suit this purpose. There are plenty of games for kids and adults, ensuring everyone involved will have a great time. You can even set up AirConsole when unexpected visitors stop by in the future! No more boring overnight visits in your place! Thinking of having a party for your birthday? If you want to invite your closest pals to get together under one roof, then you can keep everyone entertained with eight player games. 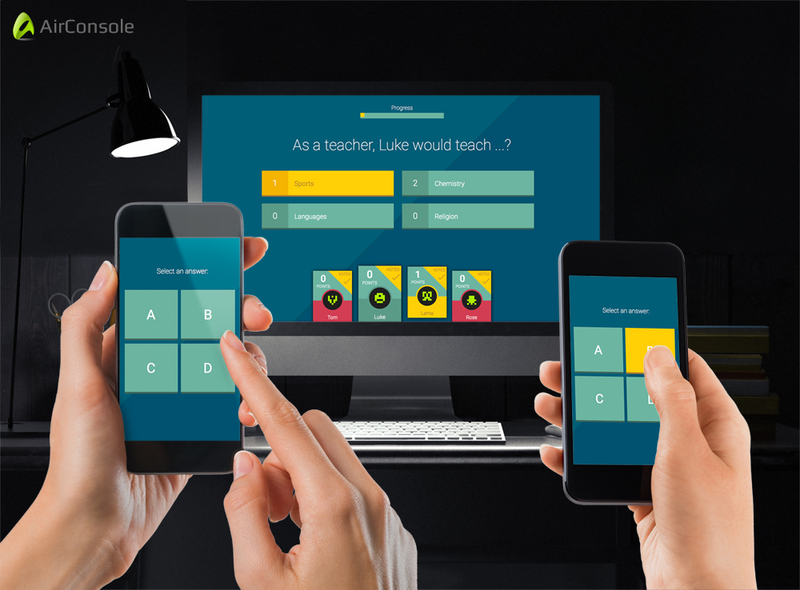 You can even create your own quiz game featuring questions about yourself. It’s a unique game because you will be able to see how well your friends know you! It’s everything you need for an epic birthday bash. Tower of Babel: You and your friends go head to head to see who can finish building their tower first. No cooperative play in this game, so the winner takes all in this one! Racing Wars: Not everyone likes a good clean race – when you want to get a little dirty, then this is the game to play. Shoot opponents and use your special abilities to get ahead and steal the race. The Neighborhood: In this game, you ban together with three of your friends to go against another team of four. Both teams are feuding neighbors who do whatever it takes to destroy the other’s home using creative weapons of choice. ClusterPuck 99: Sports enthusiasts will like this game that’s designed for the most competitive of people. It can get really intense, too – definitely something you want to check out. Simoria: This is a unique game that allows you to create a secret identity to deceive your friends – sounds like a whole lot of fun! Start Playing 8 Player Games Today! You don’t have to wait until the next holiday, birthday, or other special gathering to get together and enjoy group games. You and your group can always enjoy a good time together. AirConsole is always coming out with new games for eight players, so things will stay fresh for many years to come. Not to mention the fact that you can play AirConsole anytime and anywhere you have an internet connection. The great thing about AirConsole is that you don’t have to pay a penny to have a great time. Everything is free – you will never need to download any software or pay for additional equipment. All you need is either a desktop or a laptop to use as a screen. If you have a smart TV, you can even use that. Your smartphone is the video game controller. We know that AirConsole will be your go-to entertainment the next time you and your friends and family get together. Get started playing multiplayer games. You can start as early as right now!